The section on the Domesday entry is now a sub-section of Early history. Geoffrey le Faucher, living in Ashburton tithing, was outlawed with another man for the death of John the marshal. William Alisande, living in Ashburton, killed William le Mazacrer and fled. Ashburton was in mercy for not producing him. ** To be in mercy was to be liable for a financial penalty, or amercement, to be paid to the King. *** An assize was a meeting of vassals (free men with obligations to a lord) with the King, and the decrees issued afterwards. 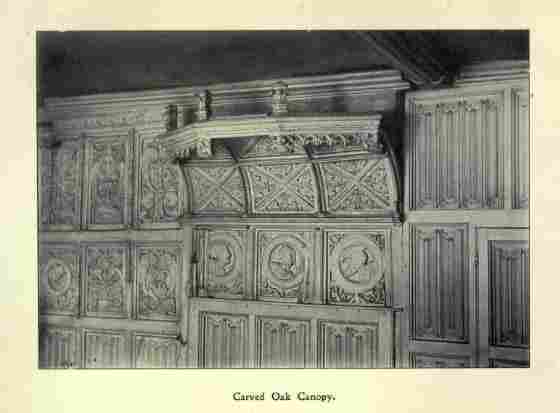 In the early 1900s P F S Amery wrote an article in Devon Notes and Queries about some oak panels from the 1500s, which were in a house belonging to one branch of the Prideaux family in Ashburton. 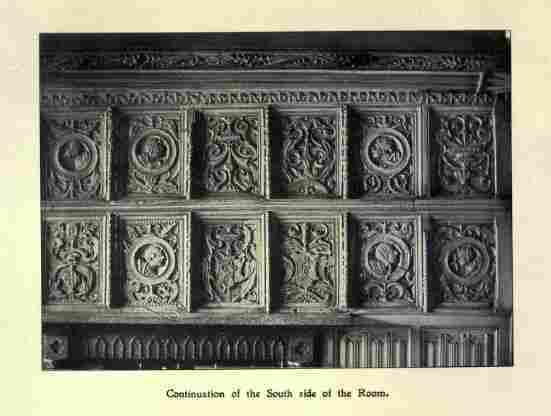 According to Amery the house passed down to the Parham family and then to a Mrs Cruse, finally being sold in 1905 after the death of her husband.These panels had recently been removed from the house, and were now out of the county. It had been thought that the panels originated in St Andrew's Church, and had been taken out at the Reformation, although there was some dispute about this. The panels were in a small back room in a house in West Street, very close to the parish church. The back buildings and stable were accessible from the left of the church gates; there was also a footpath under an archway that led to the same buildings. The old walled garden formed a boundary to the churchyard on the eastern end of the church. The wainscoted room was about 14 feet square and about 8 feet high, with a canopy on the western wall. 'W.P.S.' writing in the Exeter Flying Post in 1851, says that it is erroneous to think that the house belonged to the abbot of Buckfastleigh. The 1891 census shows an Edward and Elizabeth Cruse living in West Street. Edward is 70 and living on his own means; Elizabeth is 71. In August 1905 Sawdye and Son sold a large amount of antique furniture, paintings and china from Paradise House in West Street, on the instructions of the representatives of the late E Cruse. 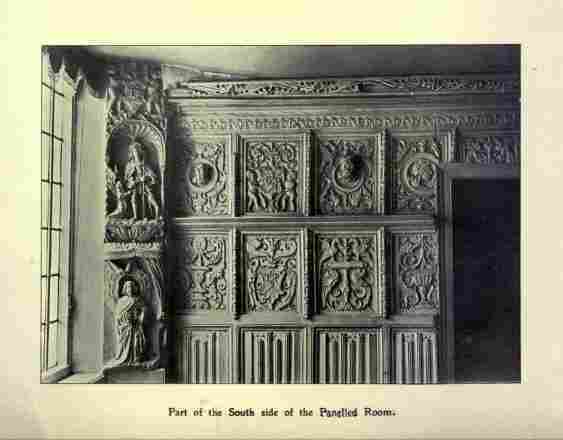 The panelling is not mentioned. In 1585 Queen Elizabeth restored to the vicars choral* of Exeter Cathedral various lands. These included a close at Stonehill, within the borough of Ashburton. Taken from the Subsidy Rolls and described in a paper read by J S Amery in 1896, these names come from an assessment of people's land and goods,on which they had to pay an amount of money. The paper was published in the Transactions of the Devonshire Association, and is available freely through https://archive.org/. The forenames towards the end of the list are only partially visible in the scanned documents. 1590 Gift and bond from Christopher Lange of Ashburton, glover to John Blundell of Ashburton, merchant March 26th, for a close of land, consideration £11. OCLC (online computer library centre) number 434516091. 1600 Bargain and sale from Christopher Lange of Ashburton, glover to George Crust of Ashburton June 25th. Rate for the relieffe of the power. Wardens: John Roger gent and Thomas Arscott. Overseers of the power: William Stevens, Thomas Oger, Richard Harell, George Ffabian.